One of the chief things standing in the way of further production of more graphic adventure games, of the sorts that made publishing houses LucasArts and Sierra On-line famous back in the late '80s and early '90s, is the long-held notion within the video game industry that graphic adventure games won't sell well enough to recoup those companies' investments. Thus, pioneers of the genre who are still in the industry have found themselves unable to sell new adventure ideas. 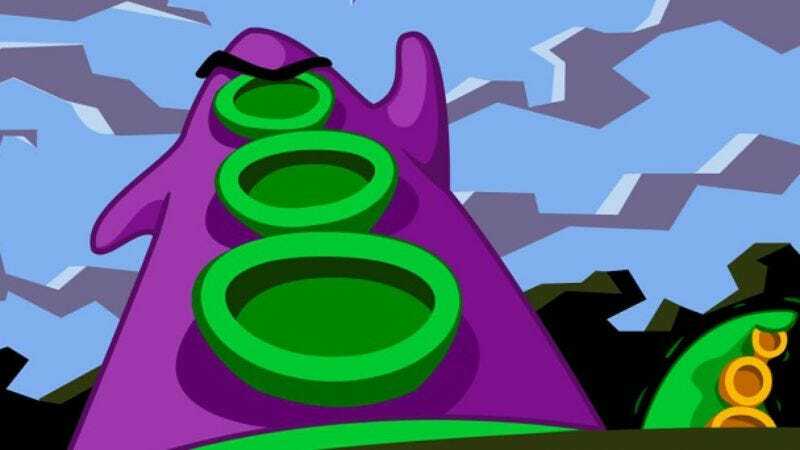 Those pioneers include Tim Schaefer and Ron Gilbert, both formerly of LucasArts and now working for Double Fine Productions, two designers who have been behind such classics as The Secret Of Monkey Island, Day Of The Tentacle, and Grim Fandango. Schaefer decided to put the idea of whether a new point-and-click adventure game in the LucasArts style could be funded by asking fans of the genre to chip in a minimum contribution of $15 on Kickstarter to get the game made. Posted early this morning, the Kickstarter funding had reached Double Fine's original goal of $400,000 within eight hours. Now, less than 24 hours after it was posted, the game's funding promise has reached over $1 million. The company says the extra funds will be poured into making the game (and the documentary covering the making of the game) even better, allowing for, say, better quality of music and voice acting. What's more, the project will still be up for funding through the middle of March, so it's not inconceivable that the current amount of money could double or even triple (and you can still contribute, if you'd like). Schaefer bet big on there being lots of adventure game fans out there, waiting for a chance to contribute to a new one from two of the genre's best designers, and it appears to have paid off. While Kickstarter has been used several times to fund gaming projects (see also: The Order Of The Stick), the speed and magnitude of this particular Kickstarter venture suggests this could be a way going forward for adventure game fans. Whether those games would need to have luminaries like Schaefer and Gilbert attached to attract any interest remains an open question, but this is unquestionably a good day for the genre's viability.